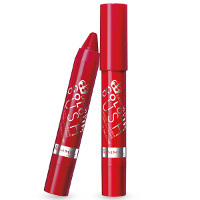 A long-lasting intense color balm in a handy jumbo pencil. Balm formula offers all-day comfort and a long-lasting surge of moisture. Give lips a rush of color adrenaline in 14 high voltage shades. This make up makes everyone feel fresh and pretty.